On the first Friday of every month we put together a curated selection of free marketing & design resources you can easily download and save. It’s just one way OutFront Brands can help you keep your small business marketing fresh, fierce, and always moving forward. Luckiest Guy is a friendly heavyweight sans-serif typeface inspired by the custom hand-lettered advertisements of the 1950s. It includes one style. This ain’t your Aunt Maggie’s clip art. These illustration & icon sets feature high quality flat design and modern typography. Zip files include both Illustrator (.ai) and EPS files. 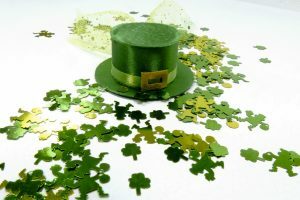 From green beer to lucky horseshoes to Saint Patrick himself—we’ve got your St. Paddy’s Day photo needs covered! This seamless animation features bright green shamrocks drifting across the screen, ready to loop for your project.